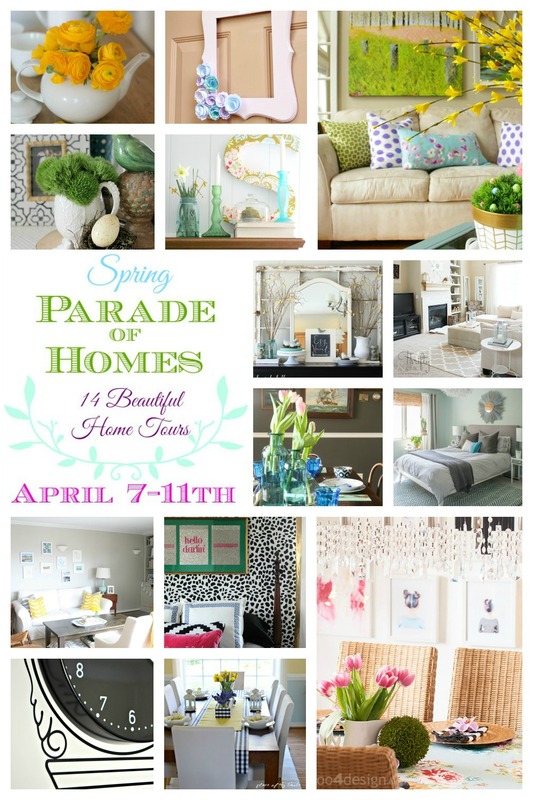 Today I am excited to sharing our Spring Home Tour as part of the Spring Parade of Homes. 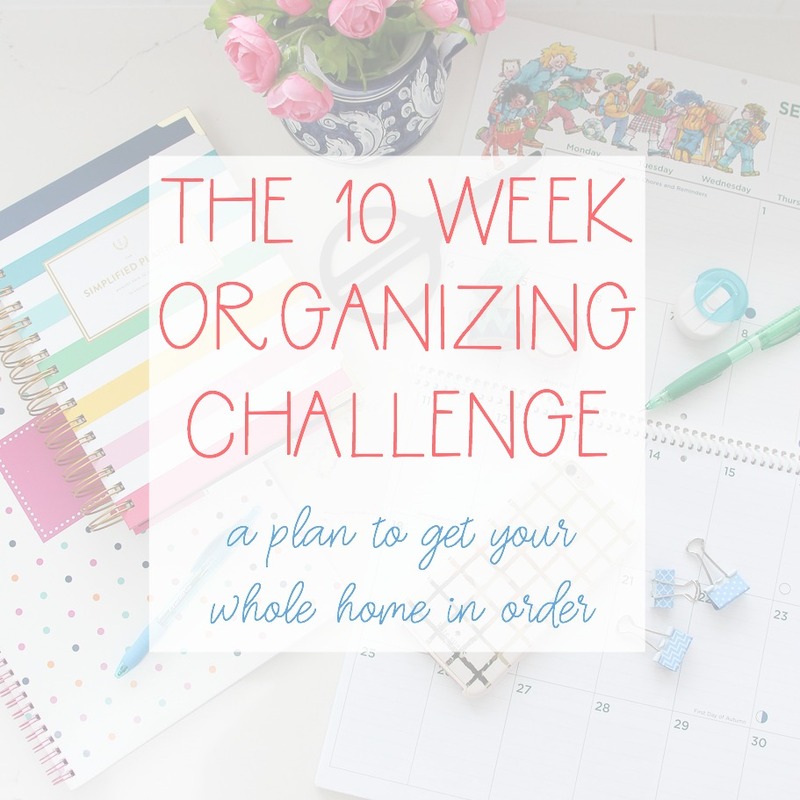 Myself and 13 other bloggers are all sharing our home tours throughout the week. I love Spring. I think I may have told you that a few times lately. It is my favourite season. Even with the crazy flash rain storms or the sometimes days on-end of pouring rain that you get. There is something about living on the West Coast where it can rain for days and days and then finally the sun breaks through those clouds and you are suddenly on top of the world and completely forget that it just rained for two weeks straight. Kind of like childbirth. You forget how bad it was once you are gazing into the eyes of your absolutely perfect new baby. 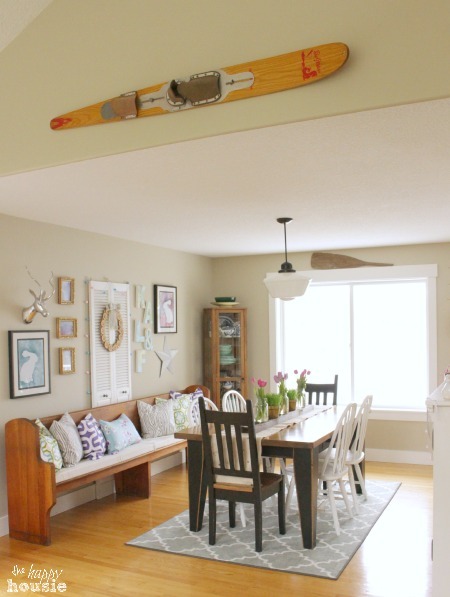 So, without further ado… here is our spring entry/living/dining room. Enough talk, it’s time for the pictures to do the talking. Those adorable watercolor bunny pictures are free Watercolor Printables by Alexis at Persia Lou– thanks Alexis! I just used PicMonkey to resize them to fit my frames and printed them on 11×17 paper. All the fabric for my cushions is from Tonic Living. I totally heart that cherry blossom print. It makes my heart pitter patter. 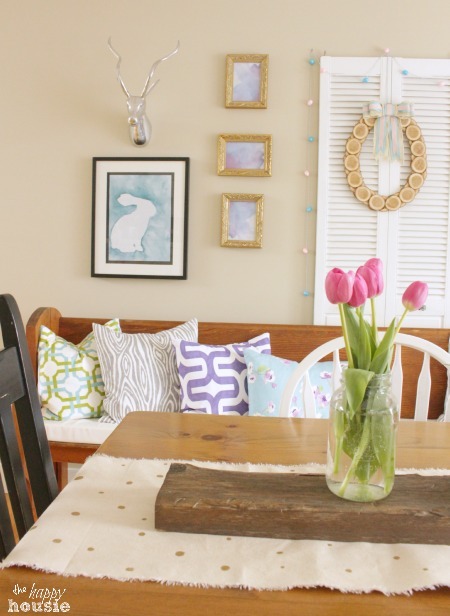 The Spring Parade of Homes is happening all week… with 14 bloggers sharing their spaces all done up and ready for spring. And more is coming as the week progresses!! I love weeks like this where I get to skulk parade my way through blogger’s beautiful spaces, don’t you? 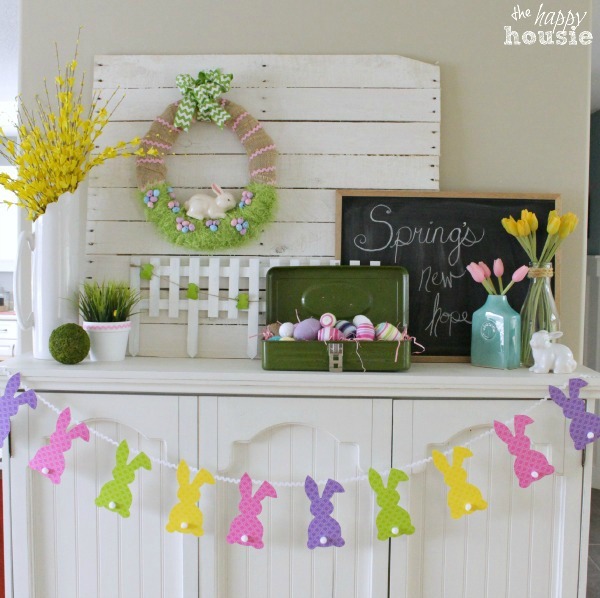 So much eye candy and inspiration all available at your finger tips… plus it is SO GREAT to see all the fresh springy décor popping up again. Ahh…sigh of relief. What a beautiful home! 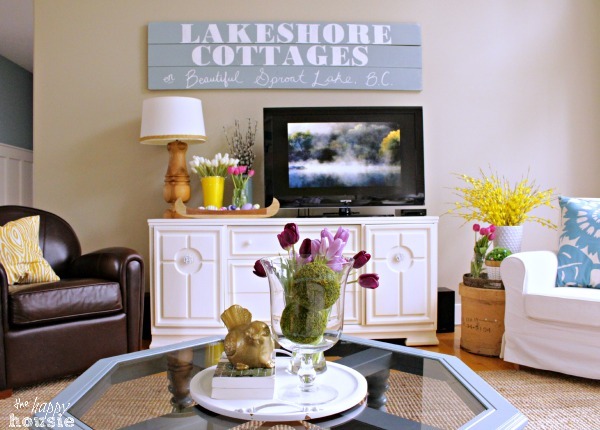 I love all the fresh spring colors and nautical touches. Gorgeous! I could be happy in your home. I love the cheerful colors. Make me want bring more cheer into my home. Oh my goodness… what a stunning home! Your colours are so vibrant and cheerful, I was smiling through the entire scroll! Lovely and happily pinned! You’ve been FEATURED at The Makers! Thanks so much for sharing your creativity with us and we hope you will stop by to link up today 🙂 Have a great week Krista! 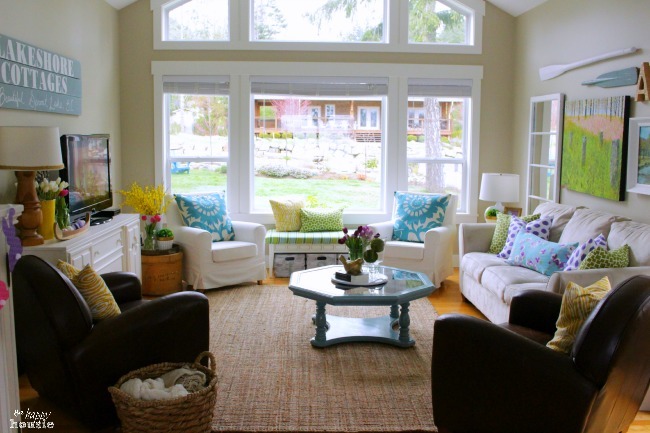 Lovely, bright living room! Inspires me to go out and get some colour to add to my own space! I love how colourful your room is, it is just so cheery! What a beautiful Spring Tour! Thank you so much for the inspiration, Krista! Krista, I am probably overlooking it, but can’t find your email contact info. I wanted to ask you to be part of my favorite room series. I love your cute colorful home! Please email me at kimnichols45@hotmail.com. Gorgeous! Everything looks so fresh and happy. 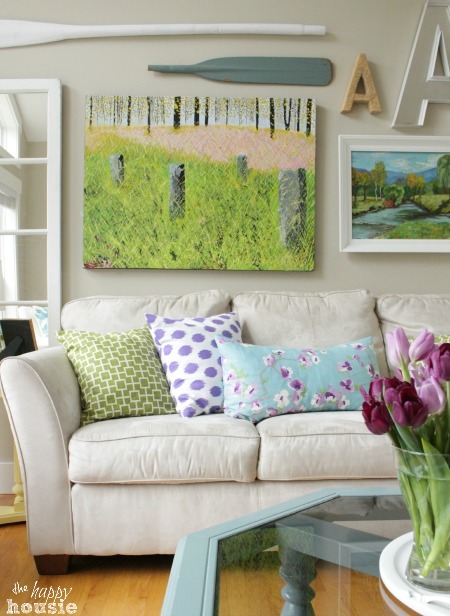 I adore your gallery walls and I am seriously jealous of that pillow collection! Aw, thanks so much Carrie!! 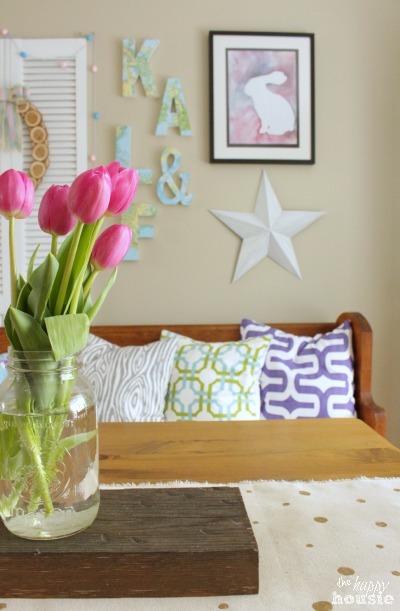 The pillows are easy to make- and I have a bit of a gallery wall addiction (something you may share with me?? lol)!! Krista, your house looks beautiful! So full of color and totally Spring 🙂 I love it! …and I love that window of yours in your living room. It’s amazing. Thank you Alicia!! I love our window too- it lets in so much natural light. You don’t really realized how essential that light is until you live in a dark house – part of the appeal of this house was the brightness of it! I just wish that window faced our lake view instead of our neighbours house – oh well:) Thanks so much for organizing and getting us going on this parade!! 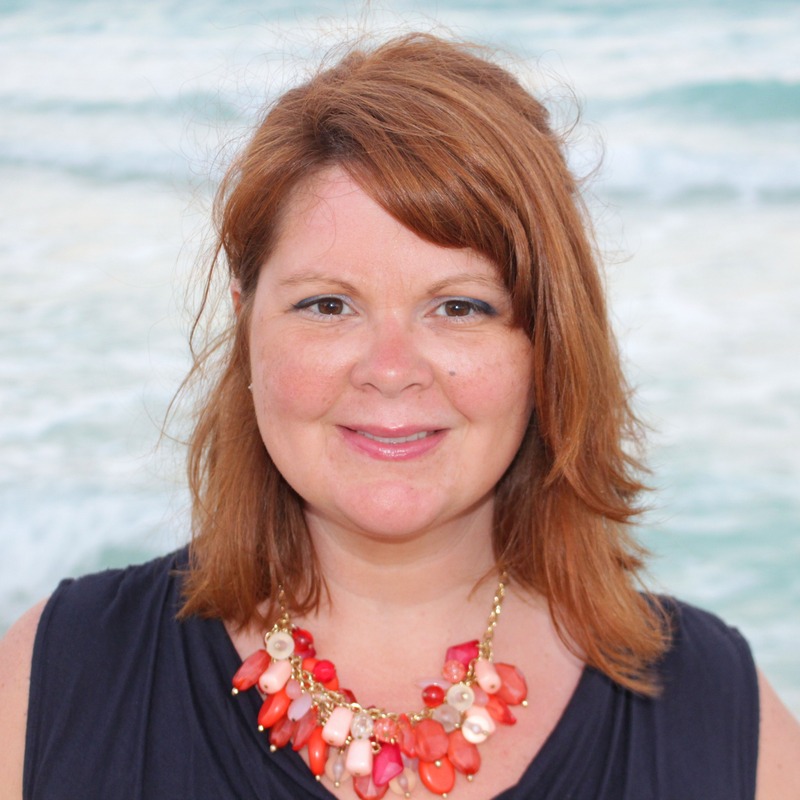 You are amazing Krista, you home is simply breathtaking! Seriously I love it all! You are hired, come on over, my home could use some of your magic! Hahaha Mindi! You seem to be doing amazingly on your own- wish I could build like you!! Thanks so much for your sweet comments! Gorgeous spring tour!! Love all the bright and happy colors! Was browsing the Tonic Living website last night (after I saw it on your sight) & will hopefully place my order today. What a fabulous selection… Thx so much for sharing. Do you have an email address on here Krista, or maybe not? No worries if you don’t! Just had a quick question! Thanks for a fabulous tour of your home! Isn’t TonicLiving amazing! 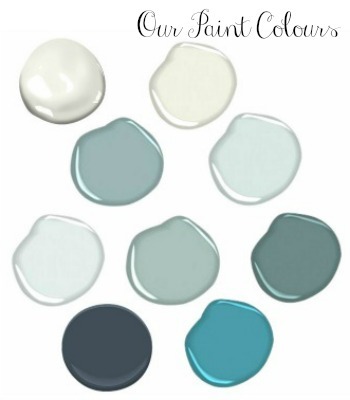 I love them… right now I am waiting anxiously for some samples to come for our Master Bedroom!! 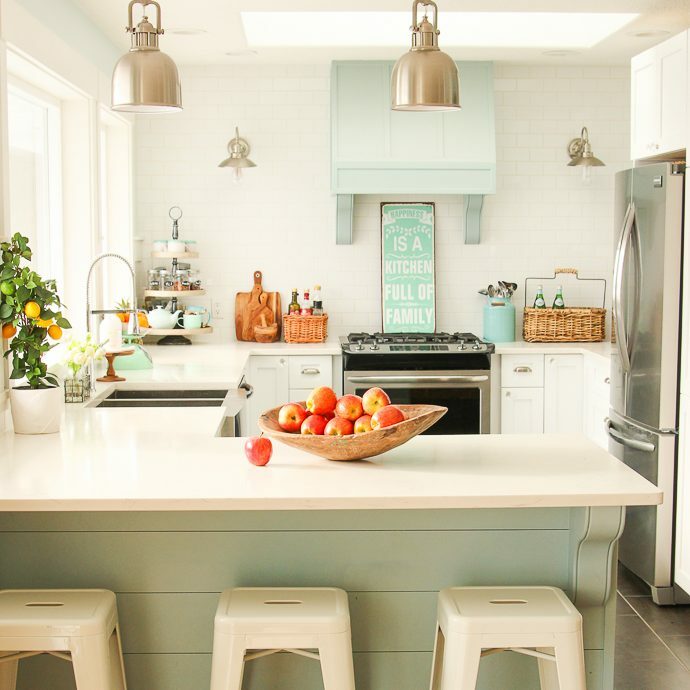 What a beautiful space – so bright and cheery! I love all the colour. 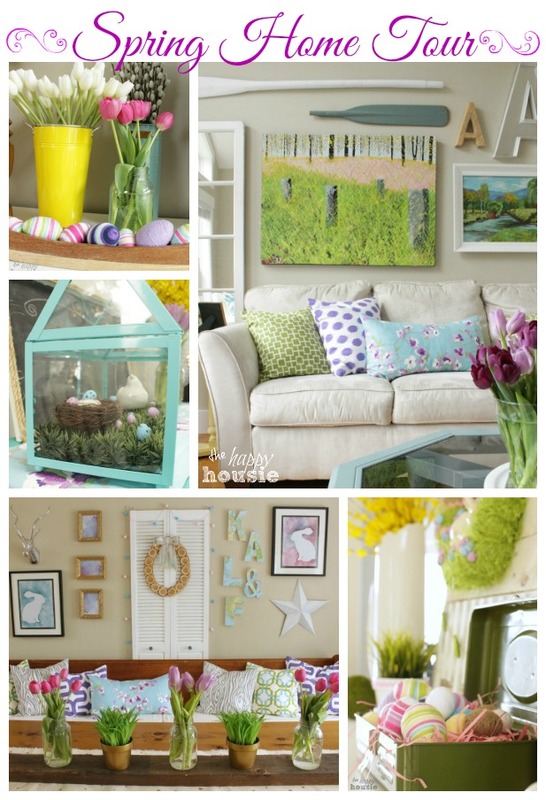 I love how pretty your home is decorated for spring! I feel like I am taking an online model home tour (which I love). Beautiful! Lol! Thank you so much for your super kind comments- they totally made my day! As always, you are the queen of mixing colors and patterns, Miss Krista! LOVE that! 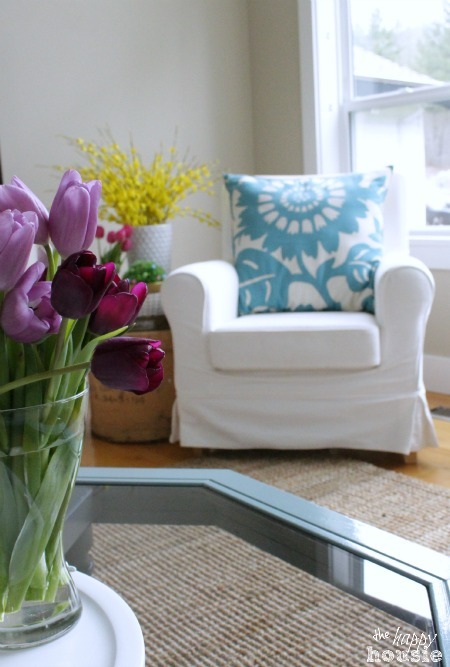 Your home always looks so cheerful! Thanks for giving us a sneak peek! Thanks Abby! Things should be cheery in the spring, right? The season of hope and new life! Thank you Christine! And thanks for the pin!! You have designed a beautiful home! Thank you so much for inspiring all of us! Aw, thank you Ashley! Your kind words are totally appreciated! Love how you’ve added the touches of lavenders and purples. 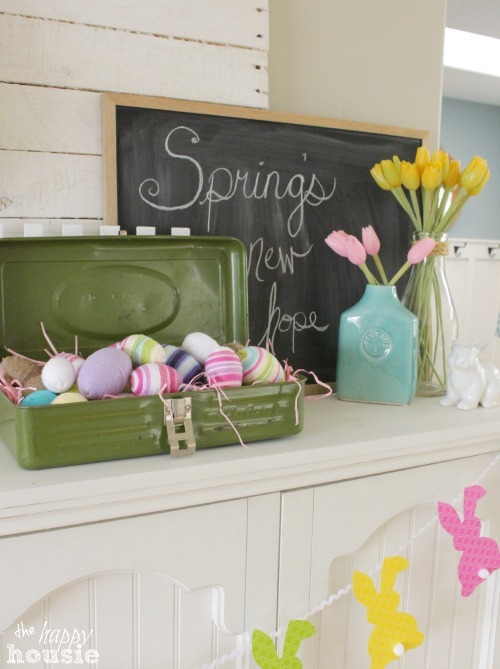 It really adds to the spring/Easter feeling you’ve created. Also love, love, love the new fabrics on the cushions. Great job, Krista! Thank you! I love the purple too – I have always liked purple but didn’t use it for a few years when we had a lot of red… I am so over the red now and excited to have some purple popping up again! 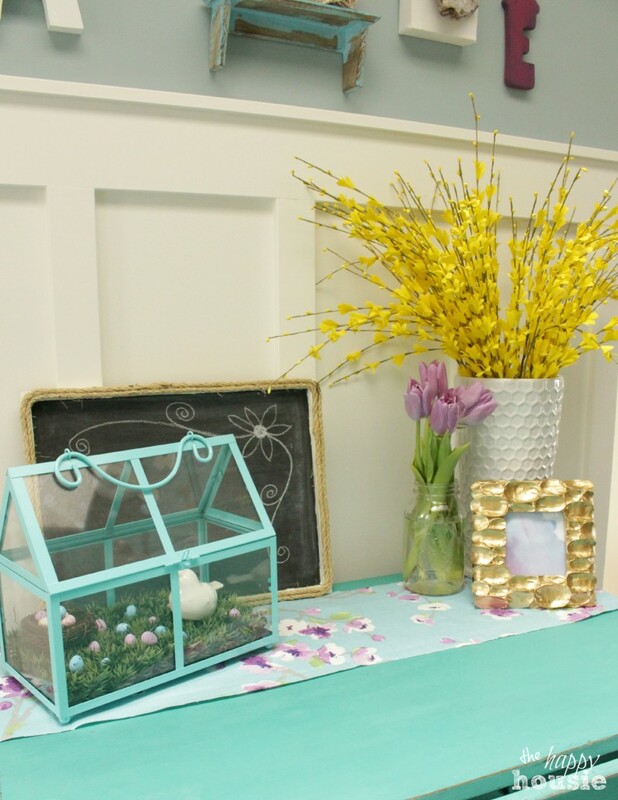 Your home looks lovely for spring! So cheerful! Uh oh Krista I’m getting sucked in! I’ll be here all night drooling over your gorgeous house! Lol -thank you! I am totally honoured to have you come by- I absolutely love your fresh colorful style and designs!! 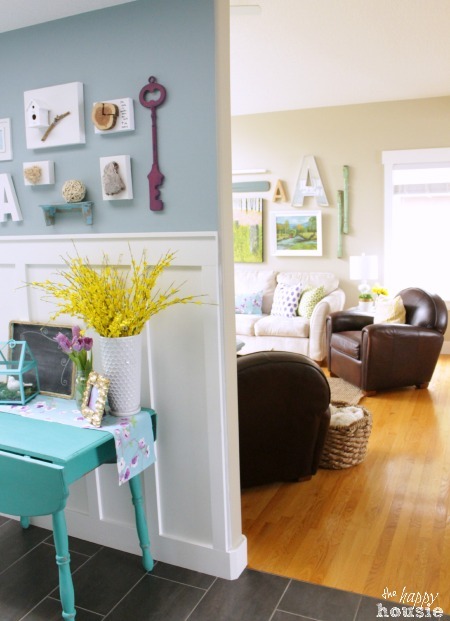 I love the pops of color you have throughout your home. It’s very lovely. 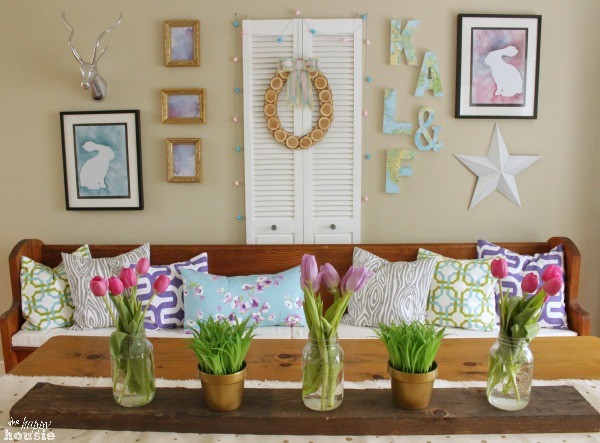 Your home always looks so fabulous and cheerful, but your spring decor is especially wonderful! Thank you April! I agree – I think that we have a spring/summer house- it suits those seasons best! Always love your home tours, Krista. They never fail to put a smile on my face 🙂 You are seriously so pro with colors and patterns! Aw, thanks Amy! Your sweet comment totally made my day! So beautiful Krista!!! 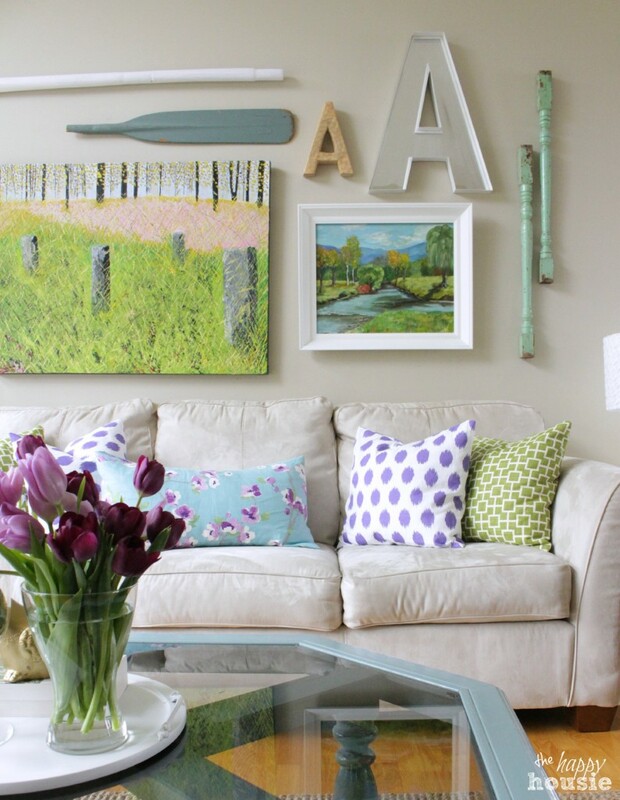 I have always adored that colorful wall behind your sofa. 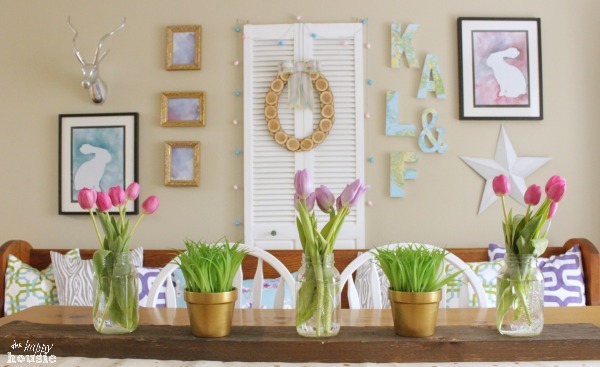 Love all of your spring touches! Thanks Jenn! It has been through some changes but I am thrilled to have my springy painting back up in honour of spring! krista, i LOVE it! you are always so good with cheery colors! 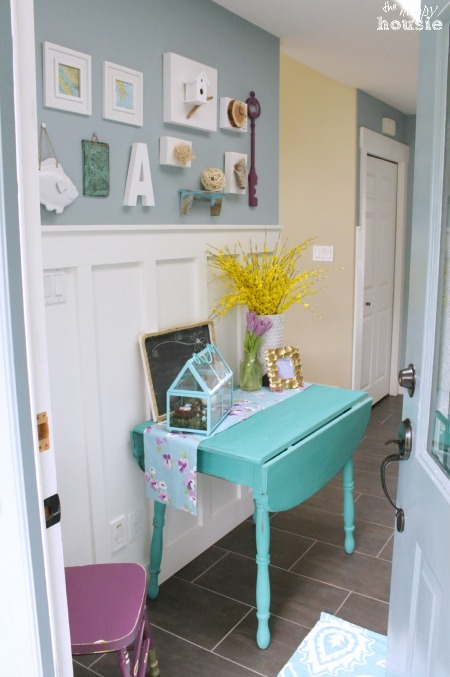 love the turquoise drop leaf with the purply chair! happy happy indeed! Thanks Cassie! I just did that chair the other day- so fun to add some purple again (and I used gold wax- super fun!!). 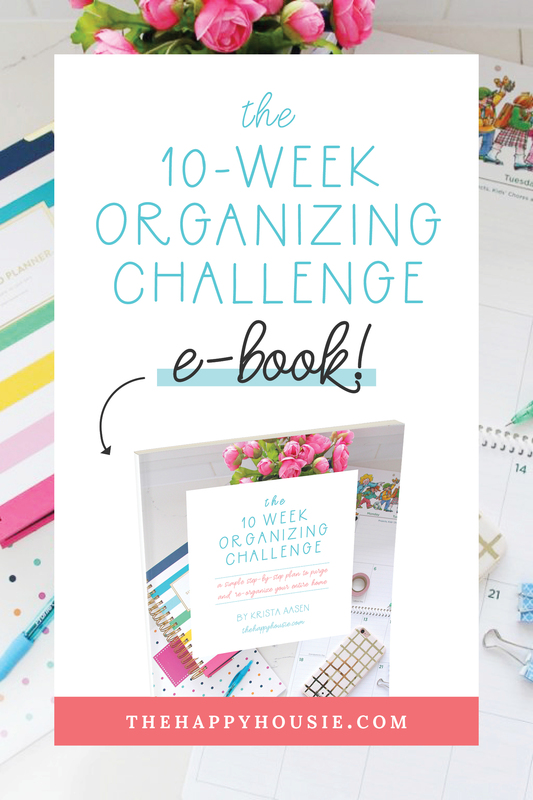 Thrilled to be on this blog hop with you! 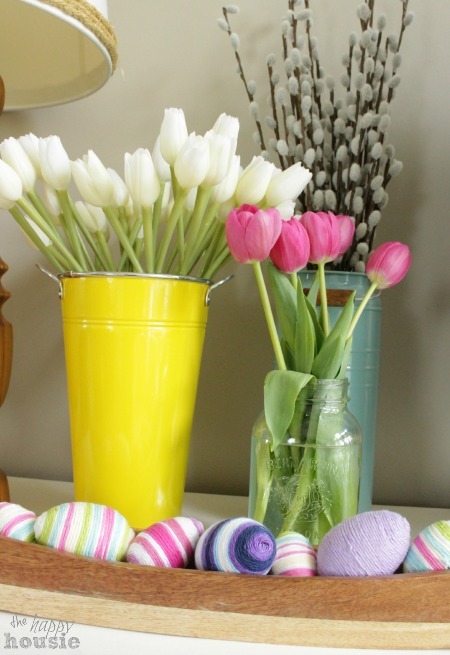 I am always left craving bright colors when I visit your blog! I love how you have color EVERYWHERE! It is just so, well, spring-y! 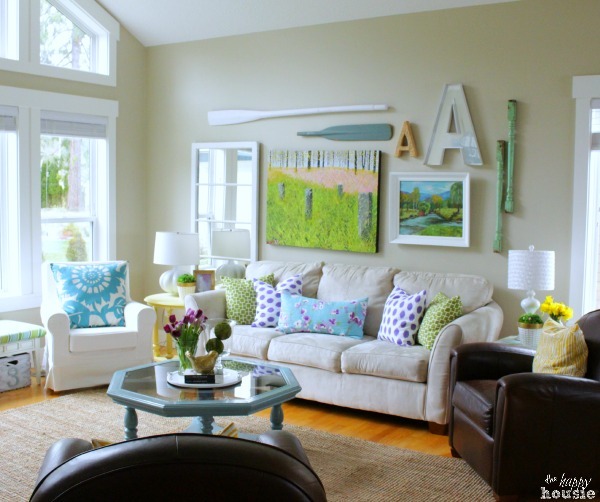 Holy cow – all the bright, cheerful colors just look SO amazing in your house!! So beautiful. 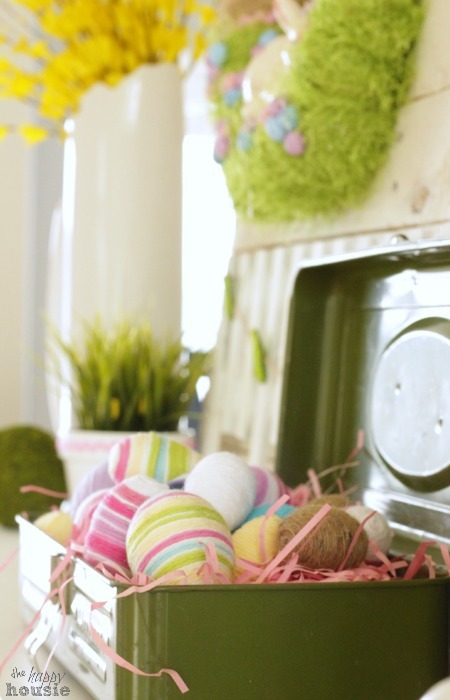 Your home is so bright and springy with beautiful colors! Absolutely amazing, Krista! Thanks for letting us tour your gorgeous home! Hugs to you. Love this! 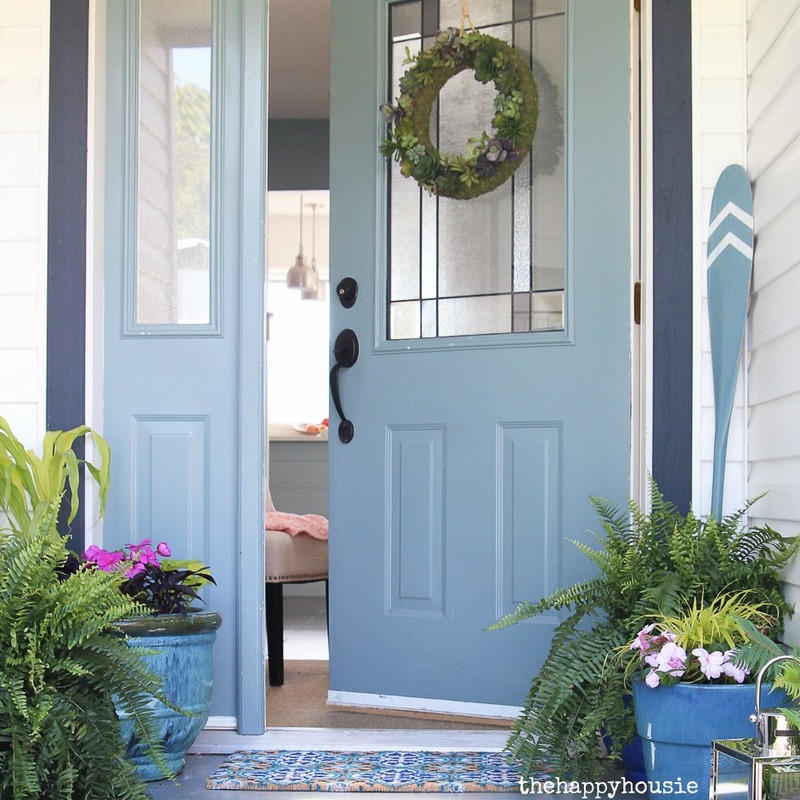 Love your creativity and how charming and visually appealing and welcoming your home is…WOW! Hi Christy! 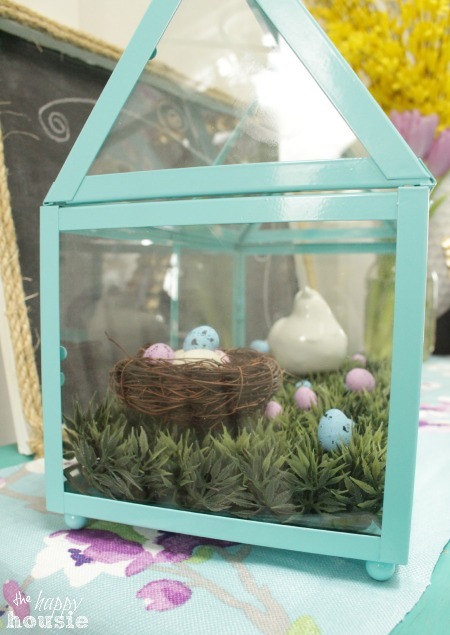 You can decorate anywhere, but natural light is there or it isn’t. We have had some dark houses so the natural light is probably my favourite thing about this house- it gets great exposure. Pretty key when you live half the year in a fog bank!! Seriously beautiful my friend! I love all the beautiful colors – it’s so bright and cheery and welcoming! You are so good with mixing colors and patterns! I just love ever little detail down to those yarn wrapped eggs 🙂 So glad to be on this tour with you! It’s all SO beautiful! 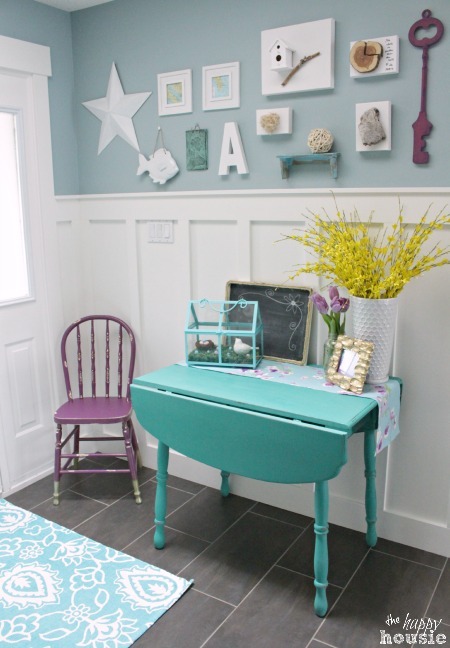 I love the touches of purple with the turquoise! Thanks Kristen! 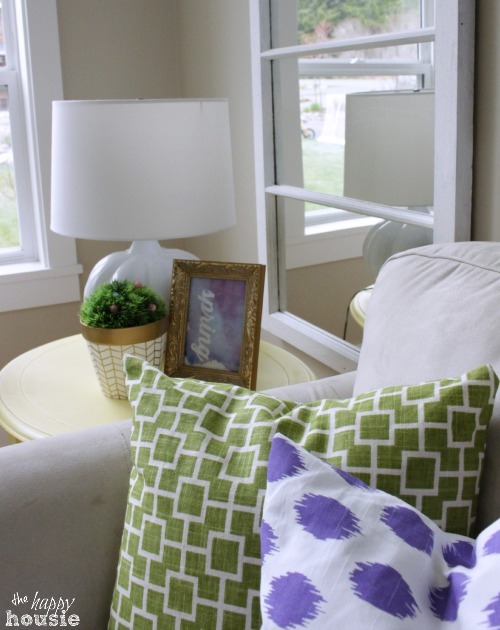 I am seriously excited about having purple in our décor again – we had red for some long but I have been phasing it out, and the change feels great! 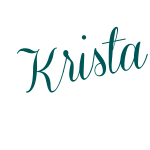 Wow Krista – so beautiful, you’ve done a lovely job!! Hi Meredith! I do love a me a gallery wall… I find it hard to just hang a single piece of art now, lol:) Thanks so much for coming by!! Your place is so bright, cheerful and pretty! I adore your big windows and all the light that shines on your beautiful decor. Thank you Julia!! I do love the natural light- we have skylights too… the light is one of my favourite things about our house (we lived in a dark house before so I appreciate the natural light so much now!). 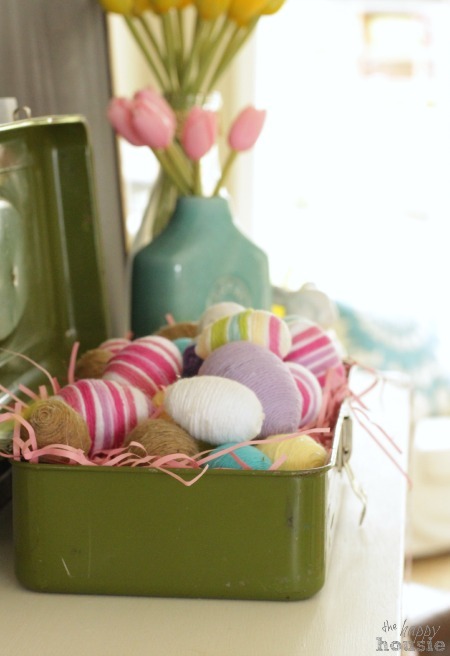 Those yarn eggs inside that toolbox(?) – adore! You have such a bright and welcoming house. Thank you Ashley!! I was glad to finally find a use for that old thrift store toolbox! Your living room is breath taking with all of that light and the way that you have decorated. I would curl up on that couch chatting over a cup of coffee any day. 🙂 Beautiful spring tour! Thank you Sarah! I wish you could come over for a cup of coffee… and the natural light is one of my favourite parts of the room too! Everything looks soooo colorful and cheerful, Krista! It must have taken you forever to make every room feel so special! Lol Jen! Things around here are always an ongoing process… a little bit here, a little bit there… you know how it is!! All these colors make me smile!